Middlesbrough boss Tony Pulis rued missed chances following his sides 1-0 defeat to Norwich City at the Riverside. Onel Hernandez's 54th-minute strike, his seventh league goal of the season, earned the in-form pacesetters a seventh successive victory. 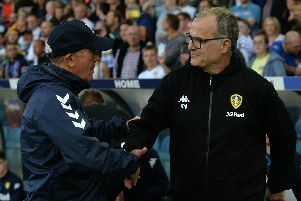 It also helped them move five points clear of Leeds at the top of the table, and seven points ahead of Sheffield United, who dropped to third after losing at home to Bristol City. Farke said: "It was a massive win today, I just can't praise the lads enough. "Middlesbrough is one of the toughest places to come in this division, without any doubt, and they were switched on and focused so to be able to travel back with a clean sheet and the victory is outstanding and a big compliment to the lads." Farke's team were backed by a vociferous following of Norwich supporters at the Riverside Stadium who watched their side take a step closer to the Premier League. The German coach says the fans have every right to dream and get carried away - but added that he and his players need to stay grounded as they chase promotion. He said: "The fans are allowed to celebrate. You start to play football because you want to play with your mates for fun and for our supporters. "They are allowed to dream and be carried away. The most important thing is that we stay with our feet on the ground. "We want to go on winning games and after 38 games we are top, but we don't want to defend, we want to attack and finish top. "To be there with such a young side at this stage of the season is outstanding and we were focused on winning this game after an international break." For Middlesbrough manager Tony Pulis, however, it was a familiar tale of failing to take any of the numerous chances that came his side's way. Being blunt in front of goal has hampered Boro all season, and they have now lost four games in a row to drop to eighth position. Boro have scored the fewest number of goals in the top half of the Championship - 40 in 38 matches - and Pulis said: "It was a very good opening 45 minutes and we had very good opportunities to score. We need to finish the chances we are creating and we have been saying that since I came here. "Goals change games but when we get opportunities we don't put them away. "We came back into it, we had three, great opportunities to score and, again, we have to score goals." Hernandez's goal came after 54 minutes, condemning Boro to a defeat they will aim to bounce back from when they face fellow play-off hopefuls Bristol City on Tuesday. Pulis added: "The big thing is we dropped our heads when they scored and we can't do that. It's an eight-game season and if we win on Tuesday we go back into the top six and players have to relish the challenge.